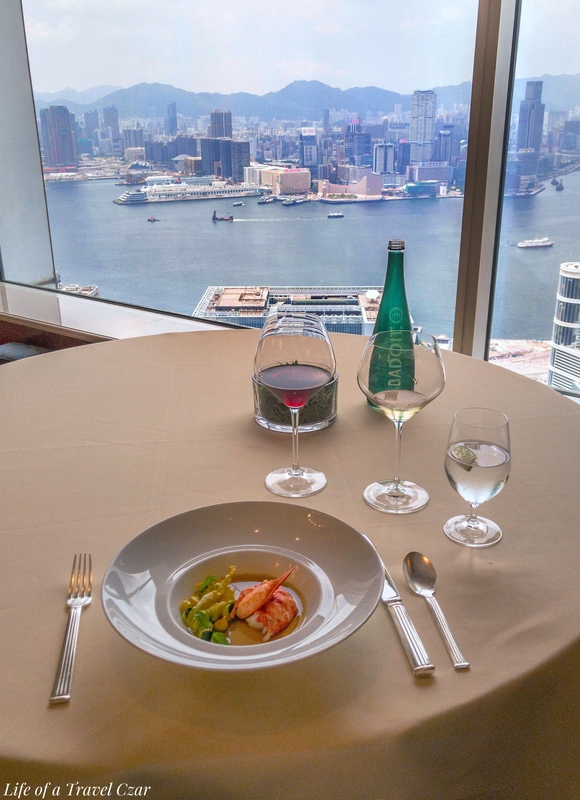 I am here at Restaurant Petrus at the Island Shangri-La in Hong Kong for a leisurely lunch. I have dined here once before and it was a memorable moment and so I am back to reaquanit myself with this fine venue. The entrance to the restaurant gives one a taste of things to come. This is a dining venue like no other. The beautiful crystal chandeliers, regal black marble columns, and the classical painted “Sistine Chapel style” domed ceilings place one more in the splendour of Versailles than the far east orient. The carpets are plush and would probably be comfortable to sleep on compared to most four star hotels. Elegant gold rims surround most fixtures and fine polished wooden trolleys move across the venue. If grandeur is the intention, it certainly hits the mark – it’s palatial down to a tee. I am ushered to my French Louis XV style dark teal chair. 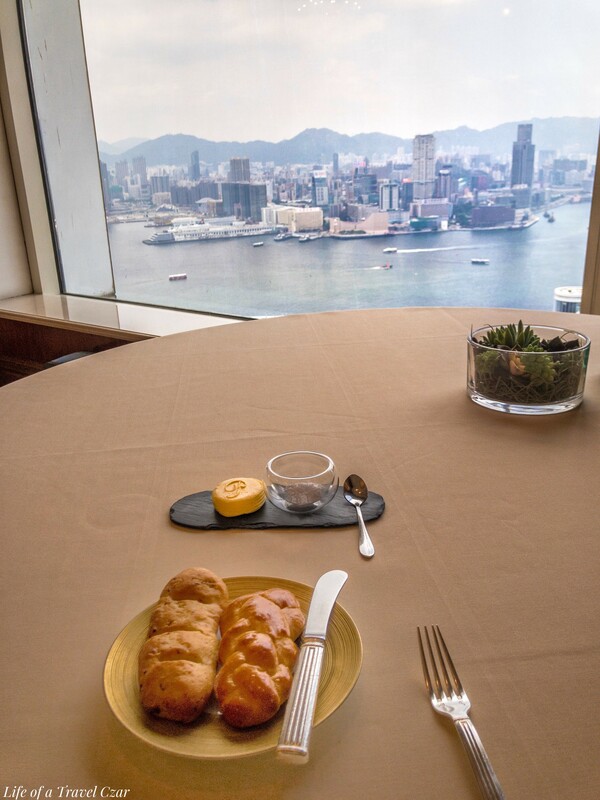 The table cloth is a light peachy cream and the beautiful draped curtains are parted for what is an incredible view of Victoria Harbour. It is simply breathtaking to enjoy ones lunch with the view of the beautiful steel structures of the CBD and beautiful vessels jetting across the blue seas of the harbour. 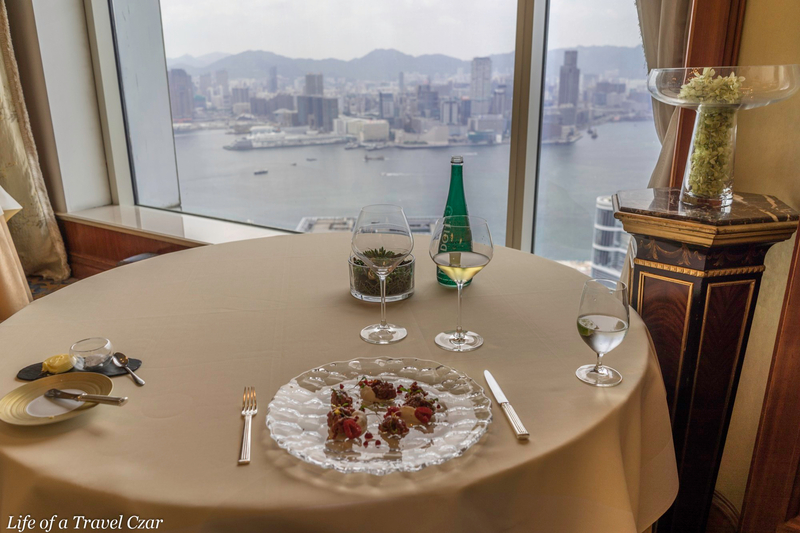 Here is a little video clip of the palatial restaurant and the dining experience – pictures and words simply won’t do! 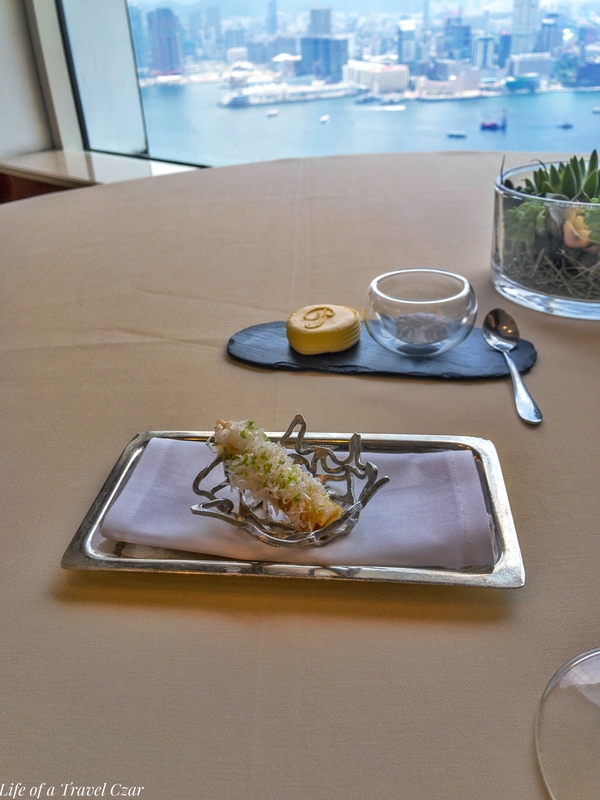 For the amuse bouche we have the Crab spring roll with Parmesan. It’s incredibly delectable with a light crunch, tangy richness of the Parmesan and the soft crab meat. For the bread, I opt for the brioche and the bacon bread which is served with a beautifully sculpted creamy butter. The breads are freshly baked and are perfect with the butter. For the first course I select the Beef Tartare with Raspberry and Coriander. The raspberries give the dish a nice aesthic layout to balance the tartare. I must say I typically prefer tartare in a single mound. This is a rather interesting dish. The beef tartare perfect with nice natural flavours of the beef and light seasoning shining through. The raspberry and the coulis is a little out of place in the dish – didn’t think it went well with the beef and was probably a little too sweet. The dish has some light cream and seeds for crunch which is a nice touch and adds a little more balance to the dish. Upon discussion with the sommelier, he recommends that the dish is paired with Napa Valley Chardonnay. I was initially hesitant but yielded to the recommendation. The wine has wonderful stone fruit and citrus notes to allure the nasal senses. 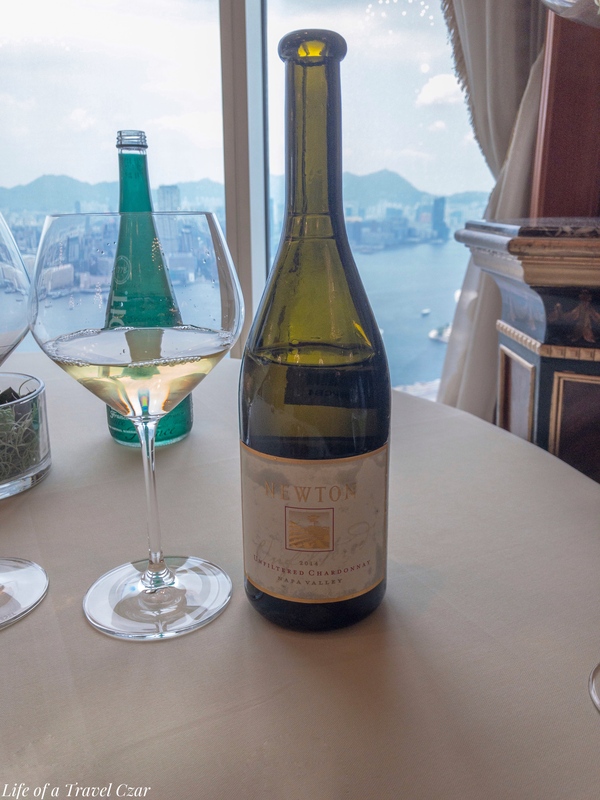 On the palate it is little bit more complex; with mix of white peach, tart and sour citrus (the tartness is on the first taste but dissipates a little and the sourness lingers) with a flourishing acidity. In the finish there is a beautiful stony minerality which leaves and exhilarating sensation in the mouth. It’s a great wine – the only question; its it right for the beef tartare. 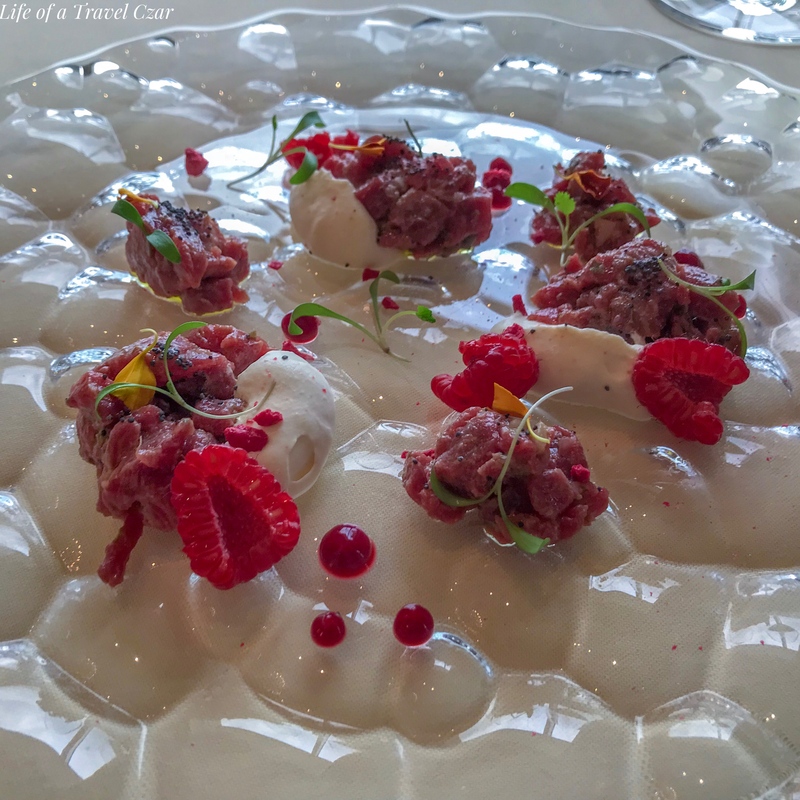 The raspberry in the tartare gives the dish an unusual sweetness which may have made the pairing a little difficult compared to the standard power lunch style tartare. The tart acidity and sourness of the Chardonnay do go well with the tartare, however I am tempted to say I would have preferred a more traditional pairing for the tartare but I do think the Chardonnay was worth the try. For the next course I select the Red Prawn Ravioli with Spinach and Bisque Sauce. The dish is a classic – there’s the sweet rich bisque and the succulent red prawn with the encased in the beautiful floury ravioli blanket. 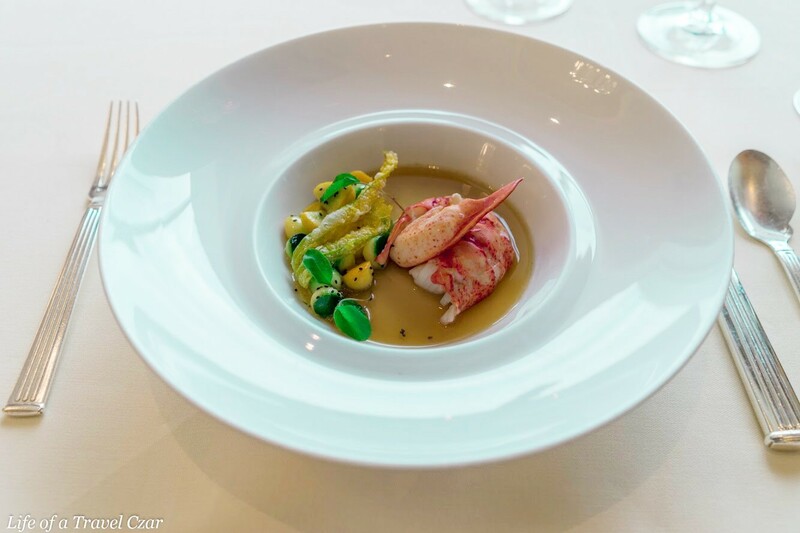 Every taste is one of the natural salinity of the prawn, the sweetness of the bisque which is a pure dream. There are some seeds on top to introduce a little textural contrast as does the leafy spinach. Having loved the Napa Valley Chardonnay – I decide to stick with it for the prawn ravioli. Although I had mixed feelings on its pairing with beef tartare I was certain it would be “meant to be” kiss with this dish. 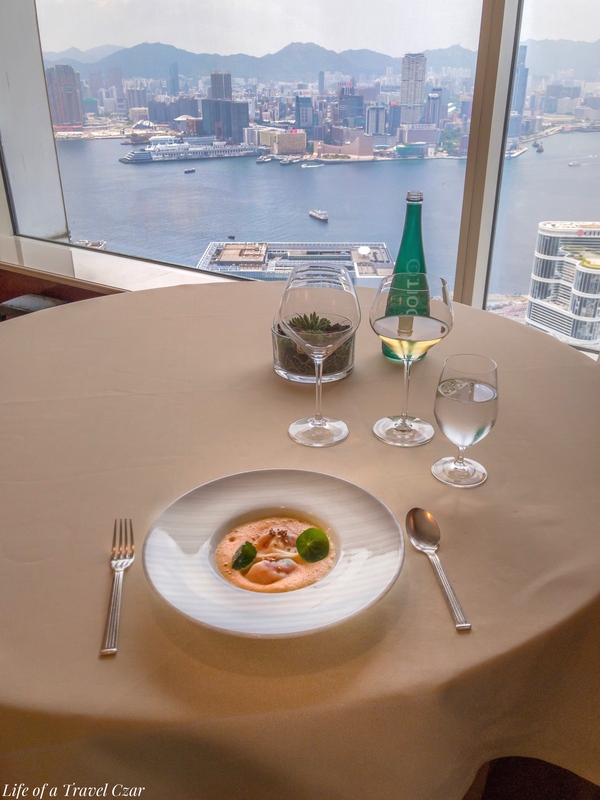 The wonderful citrus and acidity with the lighter notes of stone fruit prove themselves against the richness of the bisque and delicate prawn. The Chardonnay cuts through the richness and shows its delicateness when it needs to – definitely happy with the pairing. 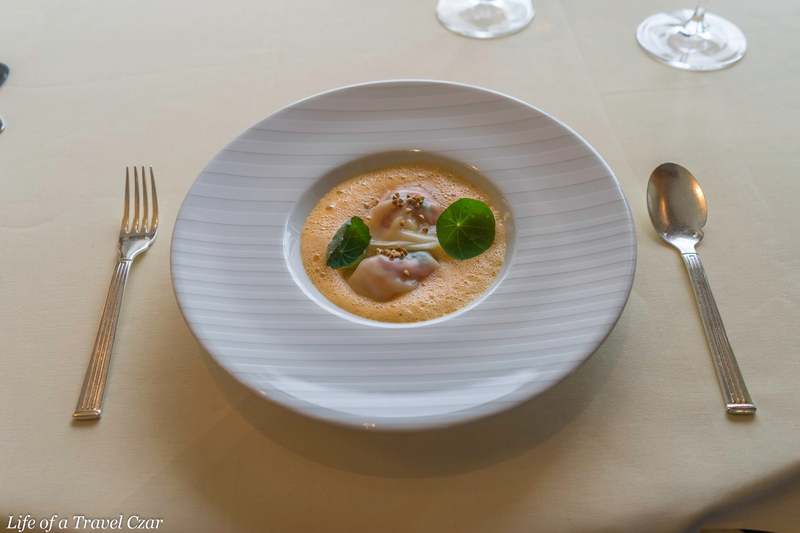 I take a little spoon of the prawn and the bisque and savour the culinary experience – it feels like being kissed by the ocean. The Chardonnay flows with effortless grace to paint my tongue with its stony flourish. The imperial splendour of this palatial restaurant continues to overwhelm my senses as I look out the window to the glow of the afternoon sun which paints a beautiful reflective glow across the waters of Victoria Harbour – the world is happening but I am lost in myself…it’s a moment I wish would never end! 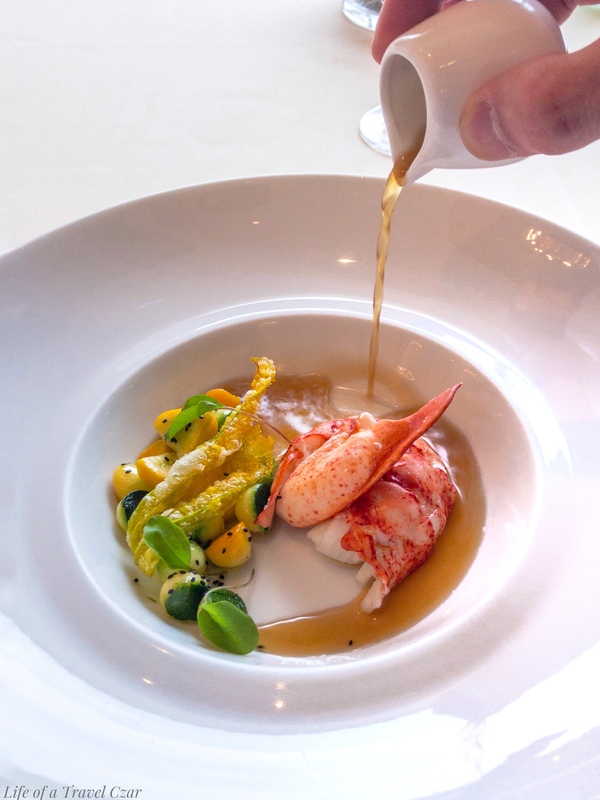 For the main course I opt for the Poached Lobster with Zucchini Colours, Basil and Grilled Vegetable Bullion. The sweet succulent lobster is front and centre for this dish. It is placed in the centre of the plate accompanied by the colours and textures of zucchini flowers. Then a gentle saline flow of the vegetable bullion fills with plate. The salinity of the bullion is perfect with the sweetness of the lobster. The crunch of the zucchini flowers adds a nice touch as do their aesthetics. It’s light and a nice difference to a traditional bisque and seafood approach associated with Escoffier cooking (like the previous dish). To sit, to taste, to sip, to gaze and to love; it’s the poetic assiette of the lunch which strokes the soul with the allure of culinary pleasure. 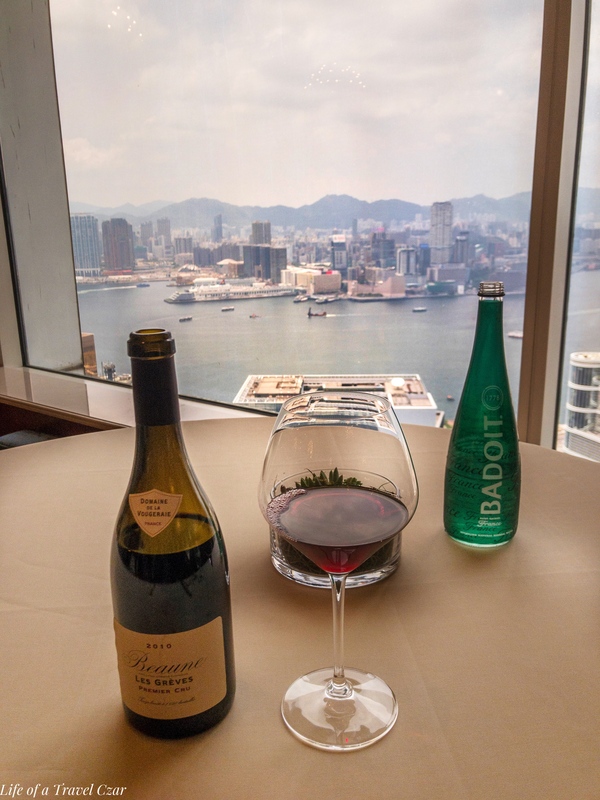 Again, I relied on the sommelier’s recommendation for a wine and paired the dish with a Burgundy Pinot Noir which was a nice break from the Chardonnay. On the nose there’s the imprint of black cherries and plums with a nice flow of sous bois. On the palate the wine leads with rich flavours of cherries followed by earthy notes. The wine has beautiful minerality and high acidity which balances the fruit for balance. The fruit intensity appears (worryingly) quite deep on first taste but eventually tones down to not interfere with the lobster. The acidity pairs with the lobster and the fruit plays well with the lobster’s sweetness. The herbs and earthy finish goes quite nicely with the bullion. It’s a non-traditional way to pair with the lobster and am glad I went with the recommendation. 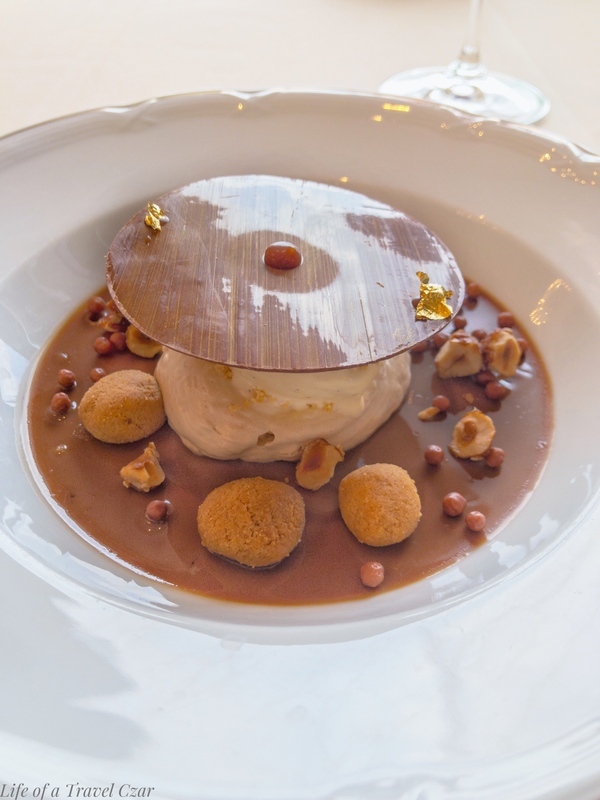 For dessert, I opt for the Jivra Milk Chocolate, Hazelnut and Caramel and Tahiti Vanilla Ice Cream. I am not normally a dessert person but I can’t go wrong with this choice. The rich flow of cocoa on the palate from the disc which is crisp and has a little crunch on first bite starts proceedings. The crumbly crunch of the hazelnut biscuits leave a lovely mouthfeel and get perfect marks for their texture. The messy part is scooping the sticky gooey caramel base which leaves a burnt sugar sensation on the palate. 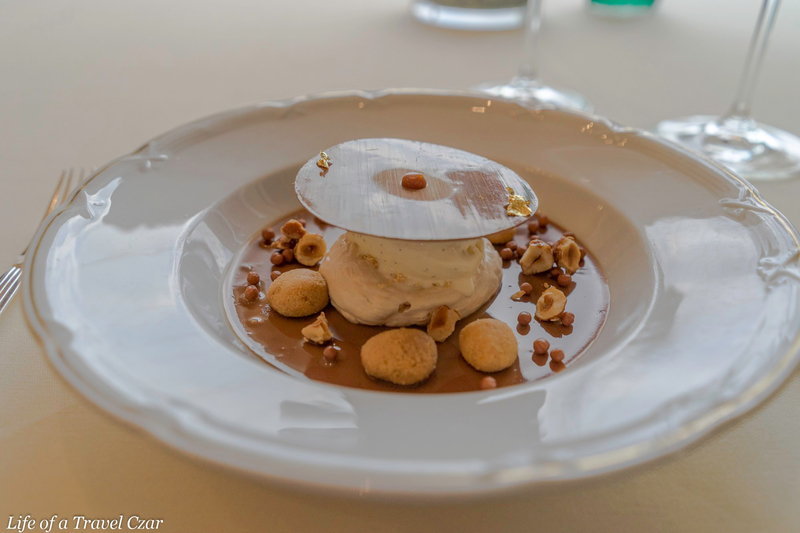 The mix of flavours is complete with the rich ice hit of the Tahiti vanilla ice cream – surprisingly the vanilla dominates quite nicely given its competing with the chocolate and caramel. A truly transcendent experience I must say. 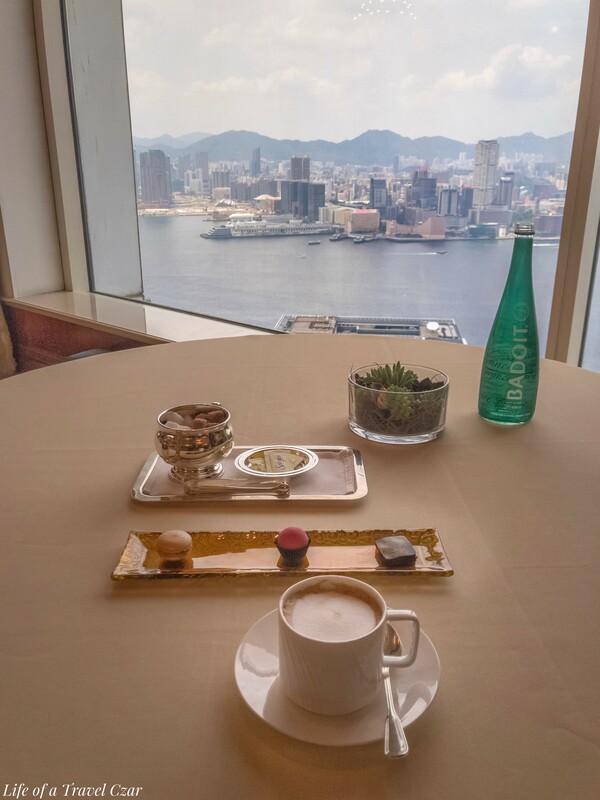 To sign off on this wonderful afternoon I have a coffee with some petit fours while gazing at the beauty that is Victoria Harbour. 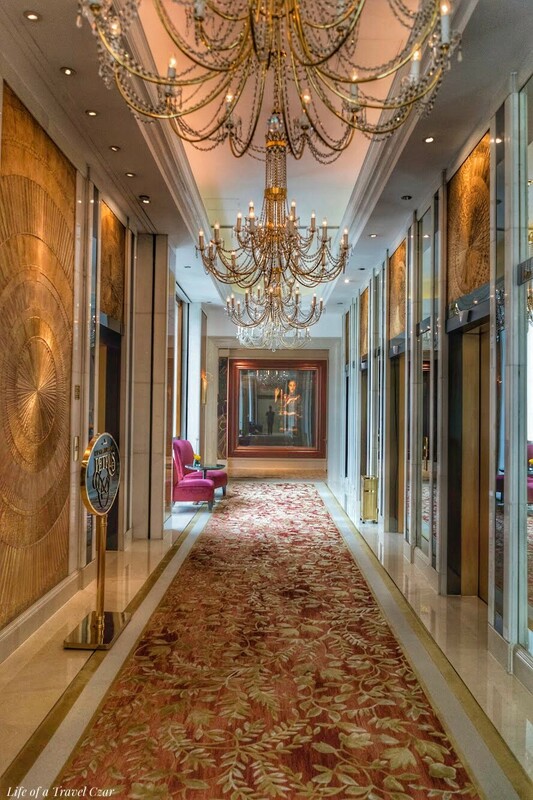 The grandeur and glamour of this place along with the view of Victoria Harbour is just breathtaking. I would dine here just the setting and the view. 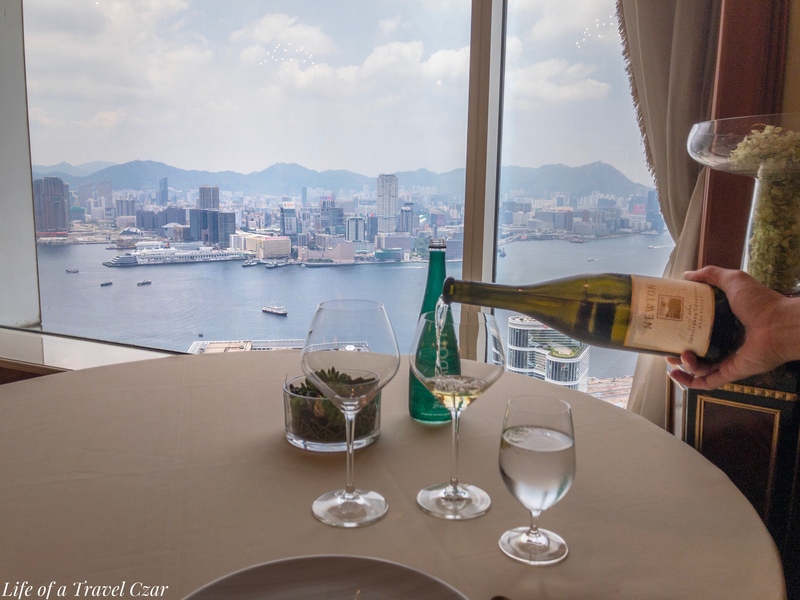 The wine list is extensive which is important for me and I could not fault the service either – sauces poured at the table dishes properly explained and no request left unattended to. The prawn ravioli and lobster dishes were the standout and both wines were lovely. The dessert was primo although I probably didn’t quite warm to the beef tartare. The ambiance of the place is quite amazing too; soft music, tables well spaced apart and the little touches were on point too including the cutlery, the butter mold and gilded silver pots. Definitely the way to spend a leisurely afternoon in Hong Kong. Nice food and wine! yum yum! !